Yes if you take away the best model for PIE the sotry becomes less R1a cenetric. It was someone else who shifted PIE to Anatolia ignoring that this would make R1b less important. If you want to go down that path J2 and G would be PIE groups as well. Just what the "best" model is is a matter of opinion, and not all the experts agree. J2 and G could very well be a part of the IE story. No doubt they are, to some extent at least. R1a looks good for the eastern spread of Indo-European, but not for the western. It dwindles to next to nothing in the West, and what is there can often be accounted for historically. R1a is pretty clearly connected to the satem languages, while R1b is far and away more frequent among speakers of centum languages. I really doubt J2 and G have anything to do with IE. I could care less if they do. J2, G, R1a, R1b are all found in my ethnicity so I don't know why people think I have a personal reason to be biased towards R1a. And where does centum Tocharian fit into this? Not with R1b carriers. RMS is citing a correlation of R1b frequency with Centum IE language speakers, however, he makes no claim that all Centum IE languages originated with R1b people. On the other hand, you cite an argument by exception of Tocharian being Centum and not necessarily R1b. That makes no sense unless RMS is claiming that all Centum is R1b based, which he isn't. Please, please try to recognize that 100% purity is not available in all things. The Centum languages aren't necessarily closer related to each other than Satem languages. It's just that Satem languages include innovations that Centum languages don't. In other words, Centum languages are a paragroup. They are just all other PIE originated languages. Similarly, the Yamna horizon is just an horizon with a multiplicity of cultures. It is not monolithic nor necessarily pure. If we find R1a folks in some non-IE speaking languages, should we argue by exception that R1a was not in the source population for PIE? Of course, not. The majority of the posters on this site believe R1a carriers got IE languages from R1b carriers. A couple of people might have suggested that at some point. That is the sort of thing that happens when people have freedom of speech and like to use it to toss ideas around. I cannot speak for the majority. I don't even know what the majority think. But you have had assurances from more than one person on this thread that talking about R1b as Indo-European does not mean cutting R1a1a out of the story. This just happens to be an R1b forum and so people talk a lot about R1b here. OK? Yes, Jean M is correct. If you think that "majority of the posters on this site believe R1a carriers got IE languages from R1b" then you should start a thread and conduct a poll, rather than making an assumption. You know what happens when you assume, right? Jean makes a good point. No one here is espousing an "end all, take all" position on IE, but that it is more complex than an idea such as armor-clad, R1a nomads raining down on Europe, riding white unicorns, and spreading IE in their wake. Something apparently bothers this interestedinhistory fellow about R1b. Is it NATO? The British Empire? Beats the heck out of me. I do not believe L23 arose in N Mesopotamia, but I am curious why the variance among N Mesopotamians is "not safe," according to your source. Alan may be referring to my comment further up this thread that I don't try to use variance to pin-point origins that far back in time. There has been too much subsequent movement. For example it is estimated that over 4 million people were displaced within the Assyrian Empire. Whole communities were moved from one corner of the empire to another. That sort of thing blurs the details of older migrations. We may be left with a bit of a hint in very broad geographical outline. It is not impossible that L23 arose somewhere in the vicinity of northern Mesopotamia. I've just guessed that R1b was a bit further north in the mountain valleys and by-passed Mesopotamia to move into and across Anatolia. I think the region encompassin Armenia, Eastern Anatolia and Western Iran is the home to R1b along with G, J2a and J1. The linguists Gamkrelidze and Ivanov have proposed Eastern Anatolia/Armenia as the PIE Urheimat. Of course, despite the apparently unsurpassed antiquity of the Anatolian branch of Indo-European, that is not a very popular notion here. I expect it is especially unpopular with R1a partisans. And I hope you R1b partisans realize this wouldn't automatically make R1b the PIE group. Why would it not be J2a then? Or maybe J1? Maybe even G2a? Also the Anatolian/Armenian hypothesis has major flaws anyways. Interested, it looks like you changed your tone slightly in an edit (original below), which is nice. .... Also the Anatolian/Armenian hypothesis is pretty laughable anyways. Nevetheless, could you be specific and explain the major flaws in the Anatolian/Armenian hypothesis. I suspect you are correct, but I would appreciate a better understanding of this. Jean M, you probably have an assessment on this as well. How does a hunter gatherer language come from Anatolia to begin with? Did J2a and G2a Anatolians all decide to stay home and not make it to Europe? I think you are answering a question with a question. This forces us to infer your points. Is it correct that you think that among the major flaws in an Anatolian/Armenian PIE hypothesis, you find? - PIE is a hunter-gatherer based language and if it came from Anatolia it must have included J2a and G2a with it, but J2a and G2a were not in the PIE source populations. Please describe specifically your point. Not for me. The basis of the idea that R1a1a and R1b1b2 spread with the Indo-Europeans is their present-day correlation with IE languages. Both of them. Two sides of the same story. This is not based on any homeland theory, but as it happens (surprise, surprise) fits the archaeological and genetic evidence for a spread east and west from the PC steppe. This can all be argued completely separately from the linguistic evidence that the PIE homeland was on the P-C steppe. But isn't it handy when the pieces fit? Apparently they don't fit for everyone in quite the same way. We have the posts on this thread of two stellar examples of the sorts of R1a partisans who haunt most dna discussion fora but who, until now, have been blessedly absent from this one. For them, the puzzle fits together to reveal an R1a-dominated panorama. For me, I remain unconvinced. I think the antiquity of the Anatolian branch is a problem for the P-C steppe Urheimat, as is the possibility of the existence of Euphratic, which I am not expert enough to dismiss so peremptorily. Yes I am the partisan. Not people such as you relying on fringe theories such as Euphratic or shifting the PIE homeland to an R1b area. Or the individuals who believe in the Anatolian hypothesis which is not accepted by most people in the field. But people relying on outdated and fringe theories are unbiased ones who unfortunate have to deal with people like us. The majority of the posters on this site believe R1a carriers got IE languages from R1b carriers. No they dont. Noone in this thread right now is talking about the Anatolian option. We are just talking about the subtler detail of the Kurgan type models, not contradicting it in this thread. When people say Anatolian they dont meant Anatolia geographically. They mean that a group which eventually ended up in Anatolia (probably by a western route if the Kurgan model is correct) had an extremely early form of pre-proto IE. Where they were located is not clear. They may have moved into Anatolia from the west side of the Black Sea. However, that would be incredibly useful to know because their language betrays a presence within and a fission from the groups who were heading towards PIE at an early stage perhaps in the 5th millenium BC. The majority just believe it is still, as it has been for generations, hardly an open shut case or at least it remains rather vague and the evidence subtle. I think we all agree that a social change swept Europe but the mechanisms, directions, degree of responsibility of one group or another in different areas IMO remains obscure. Too obscure anyway for the standards of proof I feel happy with. We have one beaker R1b family grave group and one R1a Corded Ware family group and some rather later steppes R1a related groups. That is a ludicrously small sample of ancient DNA to conclude anything on. As for the location of R1b, its becomee obvious for a while since ancient DNA came available and the variances were better understood that R1b places well away from the main stream of the farmers who entered Europe in the first waves of Balkans, Linearbandkeramik and Cardial cultures. As Jean says, it wasnt near the Anatolian or Levan coasts and land routes into Europe it appears. I would think the conclusion that it was somewhere east and inland is plausible. Dienekes recently suggested that G, J and R1b have a pattern in the Caucuses suggestinve that they were west, south and east relative to each other and the Caucuses. G and J fo not look like they had a similar position to R1b at all according to ancient Neolithic DNA. This also agrees with the R23* map which shows low in the west of Anatolia and Levant in terms of variance. So, I think although we may not all have identical models, Jean, Dienekes, myself and others are kind of pulling towards a similar conclusion that R1b was north-eastern relative to the centre of Mesolopotamia. How north-easterly is another question. R1b could have been holed up in Iran or another option is its absense in early Neolithic is simply because R1b peoples did not take up farming until late (possibly also linked to geopraphy) rather like the R1a people seem to have (although again this link to steppe hunters is not proven as such). I think your strangely certain feeling that we are dealing with R1a-steppes hunters and R1b/G/J/E are the first farmers needs serious revision. Ancient Neolithic DNA shows R1b was more like R1a in that it seems to have been tucked away from the path and spread of farming into Europe. As I have posted a couple of times without comment the idea that R1b peoples languages were as different from R1a as J,G and E were is nonsense. The time depth of any seperation prior to renewed contact was probably no more than 3000 years, less than the time depth between the seperation of Irish and Welsh today in linguistic terms. So, stop trying to force R1b into the G/E/J camp of early farmers on the pathways west into Europe because the evidence is totally against this in terms of ancient DNA sampling. R1b and R1a shared peripherality (if that is a word?) to the origin and flow of farming. The details remain uncertain although I would tend to agree that R1b was likely holed up somewhere west or south (but not hugely so) of R1a. Changing the subject somewhat, I believe it was on this thread that Alan expressed some interest in Beaker skulls. I came across an interesting comment on Dienekes' blog by a person with the screen name Derek. Here it is. Gerhardt emphasizes the anatomical relation of the chief type of Beaker Men to an Anatolian-Armenian breed in a proportion of the men in which one finds that steep rise of the hinder plane of the skull, but admits that there is as yet too little evidence from Armenia of the Beaker period. His view is that the type spread west in the Mediterranean." Steilkopf literally means "steep head". The possible connection to Anatolia/Armenia is interesting, to say the least. Changing the subject somewhat, I believe it was on this thread that Alan expressed some interest in Beaker skulls. Any opinions on the possible connection to nomadism, or a tribal history of it, with babies' heads bound to a board or something as the family spent a lot of time on the move? If you still think that after so many people have tried many times to assure you that that is not the case, then maybe you should change your handle to "InterestedinTrolling". I don't mind if people want to toss ideas out. I mind that very when people throw around R1b centric theories they don't get called R1b partisans who haunt every forum and don't belong on this one. Yet someone says R1a is PIE when that is supported by the Kurgan theory they get labeled as having no credibility. So, I think although we may not all have identical models, Jean, Dienekes, myself and others are kind of pulling towards a similar conclusion that R1b was north-eastern relative to the centre of Mesopotamia. Looking back in time to the origins of R1 we find a link between the Volga-Ural region and the southern Caspian basin. The Yangelskaya Culture which appears in the former area around 9000 BC is virtually identical with finds in the latter area. Contacts between the two continued even into the Neolithic. Here we have a clue that Mesolithic people carrying R1 may have moved between summer hunting on the steppe and winter quarters in the more sheltered forest fringing the southern Caspian - known as the Hyrcanian refuge. Transport by boat was within their power. Indeed images of boats, which from their stratigraphic location must be over 10,000 years old, appear among the famed petroglyphs of Gobustan beside the Caspian in South-East Azerbaijan. We can deduce that R1a arose among those of their descendants who settled on the steppe, while R1b appeared among those descendants who favoured the southern homeland, and became involved in agriculture earlier. So far this can only be speculative, in the absence of ancient DNA. Yet someone says R1a is PIE when that is supported by the Kurgan theory they get labeled as having no credibility. What you in fact said was far more provocative, as I think you probably now realise, and to make matters worse you cited as your source a person whose views you keep asking me to debunk on the General Forum here. There is in fact archaeological/ancient DNA evidence tracing R1a1a from Andronovo through a series of successor cultures to Scythians, known to be East Iranian speakers. There is no problem with the credibility of the Keyser 2009 paper. ... Yes. It is a hunter gatherer language. It didn't come from Anatolian farmers. I disagree with their being mass scale admixture and the PIE core consisting of R1b and R1a. Are my brother and I a population with admixture? - the result of interbreeding between two or more previously isolated populations within a species. Even if I had a new SNP my brother didn't have and he had one I didn't, we are still not admixture. We have the same ancestry. R1b and R1a have a common R1 ancestor. At some point, their lineages were one and the same. If that was true there should have been R1b among Tocharians, Scythians, Andronovo people, central asians. but there isn't. The steepe remained close to 100% R1a imo. Are you making the case that the Yamna horizon was a monolithic culture? Apparently so if you rely on the assumption that all expansions of Yamna groups had the same mix, which is what you are doing when you require R1b to be in every IE population. Likewise, I don't see much R1a in the Celtics or Italics, yet they are IE. It doesn't matter anyway, the Yamna were not a singular, monolithic group. They were various groups of mobile people shifting across the very large Central Eurasian plain. Wasn't the Andronovo horizon formed by Yamna people? Not a single R1b or any other west eurasian ydna besides R1a. If there was so much admixture why haven't scythians showed anything indicating that? SOME Yamnaya people formed Andronovo i.e a subset. When a subset moves it often is just an atypical fraction and you get a founder effect. The term he uses meaning flat back of the head is a far better description than broad or round headed. The beskrt heads were not really round or broad as such but simply had marked rear flattening. You could say they were essentially dolichomorphic but had flattening of the rear of the head. This is something that I think is a very very poor racial indicator given that it is often a result of cradling traditions and practices. In the short term it does mean something as new traditions probably mean gene flow but over a long span of time I think it is meaningless as skulls are so plastic and susceptable to change. However more complex study of the skulls and teeth probably do tell us something. i just think the long vs broad head focus based on head width vs back to front length ratio is an old obsession from old books with some dangerous ideas. It aguable the very worst dimesnion to base a racial typology because it is so plastic. Apparently due to reommendations to stop infant cot death syndrome that involve a baby sleeping on its back there is a modern wave of flattening of the Occiput or brachycephaly in western societies and the shape of the western head is changing as a result. There are medical articles on the web about this. Anyway that is why non-metrical studies of the skull are so much better than the simple cranial index idea. The use of cranial index to imply population history was rightly highly questioned and generally rejected for about 50 years. now now Jean, humility, its not a competition to be right or quickest :0). I just want to know the truth. If I took a stance that I will never change my opinion or admit being wrong as new data became available I would end up like one of those people who still believe in the ice agre refugia or would have never posted anything ever. The evidence of ancient DNA seems to have dimished very much the chance R1b was among the first farmers which would still have been considered incredinly surprising even 2 or 3 years back. so I would be stupid to get trapped in that worst of the deadly sins,pride, and argue against evidence. Where does Paleo-Sardinian speaking Pre-Roman Sardinians fall, how about NonIndoEuropean Pre-Roman Iberians, or Aquitanians? Certainly it is easier to disregard the Basques in their current day distribution, but in Pre-Roman times the nonIndoEuropean languages were more widespread and more numerous than today, while many of those places with putative nonIndoEuropean languages do show a significant share of R1b-M269 in their present day population. Also Sardinians are one of the few people that show long term genetic continuity, so are we to assume that they got their R1b-M269 from Romans, that would be quite unlikely. Phoenicians, even less likely, so how did they get their R1b-M269, yet remained largely pre-IndoEuropean before Roman conquest. How about the Iberians? There is both Bell Beaker and Megalithic presence in Sardinia, but they spoke a pre-IndoEuropean language, so don't really know what to make of it? @ Alan :) You are very, very right in all respects, though by the time the print version comes out it may not seem as radical as all that. Where does Paleo-Sardinian speaking Pre-Roman Sardinians fall, how about NonIndoEuropean Pre-Roman Iberians, or Aquitanians? Basque appears to be a language of the age of metal. There are clues that link it to the Balkans somewhere near PIE in origin, which could explain the R1b in modern-day Basques on both sides of the Franco-Spanish border. That doesn't mean that there is no older European DNA in the Basques. They look like the same kind of mixture as other European populations. I suspect that Paleo-Sardinian could be a Neolithic language. There was a book out recently claiming it to be related to Basque and Iberian. I was rather taken with that idea until I read into it a bit. There have been so many attempts to link other languages with Basque. It now looks like another dubious effort, along with the attempts to link Iberian and Basque. Genetically the Sardinians look like there was a Neolithic founder effect that wasn't later drowned out by Copper/Bronze Age migrations. It is possible that Iberian was also Neolithic, but given the fact that the area that was Iberian-speaking has as much R1b as the Celtic and Basque regions, I suspect that it too was a Copper Age arrival. Not autosomally, Basques do not share much with the Balkanic populations which tend to be high on the "West Asian" component, which is greatly lacking in Basques. I don't think Basque is a metal age language, if so, why would they use stone knives? Correction: Areas that were Iberian-speaking have far greater frequency of R1b-M269 than Celtic regions. Proof of founder effect? This is just an assumption. Founder effect leads to elevated levels of certain lineages but doesn't usually eliminate the others. Yet Andronovo is pretty much fully R1a with some assimilated Asian lineages. So ancient migrations between Iran/Turkmenistan and Russia ia the Caspian Sea? So R1 is Mesolithic and from the Volga-Urals. The R1 that remained in that region is where R1 formed? While the R1 that moved to Iran became R1a? I agree with the locations of of R1a and R1. But I thought ydna I was the Mesolithic marker. I don't think Basque is a metal age language, if so, why would they use stone knives? Euskara includes indigenous Basque words relating to agriculture, wheeled vehicles and metallurgy, such as shepherd (artzain), millet (artatxiki - formerly arto), wine (ardo), cart (gurdi), wheel (gurpil from *gurdi-bil, meaning cart-round), smith ([h]arotz), iron (burdina), lead (berun), gold (urre), and silver (zillar or urre-zuri - literally white gold). If Euskara were originally the language of hunter-gatherers of South-West Europe, one would expect it to have borrowed words relating to agriculture and metallurgy. A common pattern, where a people adopt a new technology from those speaking another language, is for the foreign words for that technology to be borrowed at the same time. Oddly the most common Basque words for tin (eztainu), copper (kobre) and bronze (brontze) are all borrowed from Romance. However Euskara originally had its own words for these metals. The fact that one word for silver was derived from the word for gold suggests a region where gold was discovered first. That points to the eastern Balkans, and cultures such as Cucuteni-Tripolye. My apologies. My website is down currently, as you found out earlier today. Hopefully you are still not assuming all things are pure. You said, "I thought ydna I was the Mesolithic marker." There is no one Mesolithic marker. Karafet et al, 2008, have the TMRCA for R1 as 18.5k ybp. Definitely R1 lineages were around during the Mesolithic period. I would guess descendants R1a and R1b would have been around too, but I don't think we have that precise of dating. But I thought ydna I was the Mesolithic marker. We have no ancient DNA from the Mesolithic. Y-DNA I is certainly old enough. It also appears European. However that does not mean that the men of Mesolithic Europe only carried haplogroup I. Nor does it mean that the haplogroup I we find today invariably got to its present position in the Mesolithic. R1a seems to have been on the SE edge of Europe in the Mesolithic, while haplogroup I seems to have been in the Carpathian Basin. 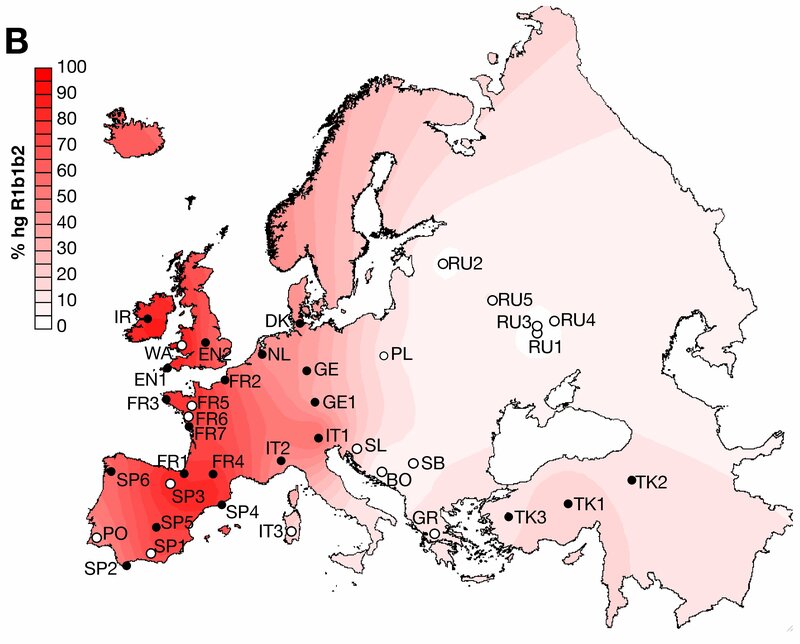 The older Haplogroup F* has appeared in European Neolithic DNA and probably arrived in Europe much earlier. True. I thought there is still a chance of Ydna I being Anatolian and at east I and I2 being West Asian?